Please join us for the musical comedy, Beauty and the Beast: A Christmas Rose, on December 17th at 5pm at a 35% discount to help us raise funds to transform the LCHS band room into a recording studio for the students. The show’s producers have made more discounted tickets available for our group! You must purchase tickets via this link to get a 35% discount and have a portion of the funds go to the High School Recording Studio. We have negotiated this rate for our group at a special on 300 tickets in different pricing areas for the 5pm show on Sunday, December 17th, at the Pasadena Civic Auditorium. Beauty and the Beast: A Christmas Rose is an original British Pantos play (contemporary musical theater comedy that parodies a classic fairy tale). It’s produced by the son of the producer of So You Think You Can Dance and American Idol. Our group will get a private meet-and-greet with cast members after the show including autographs and pictures with our kids. 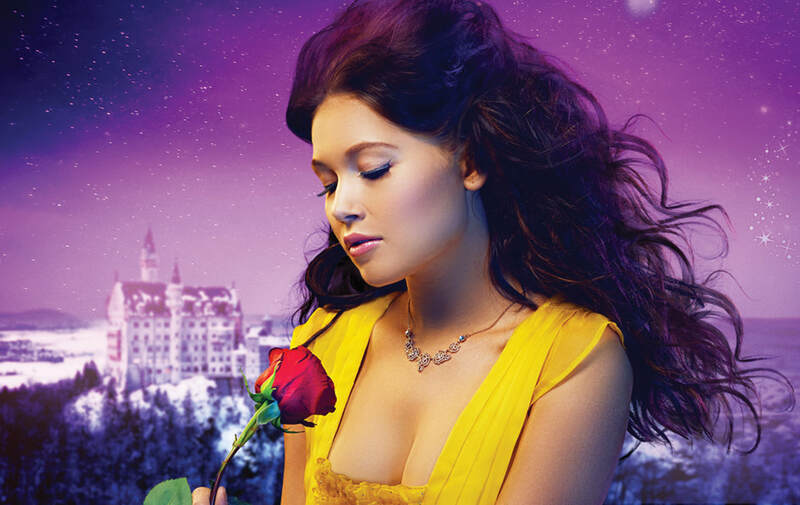 The star-studded cast features: Kelli Berglund (Disney Channel XD’s Lab Rats) as “Belle,” Jonah Platt (Broadway’s Wicked) as “The Beast,” James Snyder (Broadway’s If/Then), Harrison White (Broadway’s Lion King), and John Tartaglia (Broadway’s Shrek). The LCHS Spartan Boosters Club and the LCHS Music Parents Association are working hard to raise funds to update the LCHS Band Room area to include recording studio equipment and a recording mix room, as well as new carpeting, lighting, and paint. Currently, all musicians are taught performance. However, a huge percentage of job opportunities in music are in recording. By adding recording studio equipment, students would be exposed to performance for recording, how to record music, creating arrangements for recordings, music composition, music mixing, and post-production scoring and music for film and television. Students can learn how to lay down music tracks for them to play along with at home. 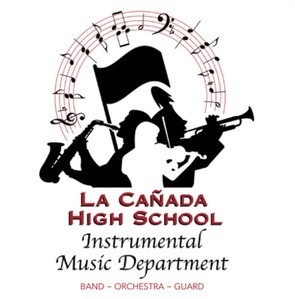 Students can learn how to work with the LCHS TV class and theater arts departments recording and scoring music for student and school productions. This would allow our music department, TV & Film Department, Theater Department, and Choral & Vocal Ensemble Departments to all grow in a contemporary way. Student videos can have original music scored, student choral and vocal groups can record songs, all the performing arts departments can all collaborate together using the new recording studio. It is very exciting! However, we won’t be able to reach our goals without your help. We need your support! Beauty and the Beast: A Christmas Rose is a funny, interactive American Panto featuring audience interaction, dancing, comedy, and lots of contemporary and classic pop music hits. This is a British Pantos theater experience. “Panto” is a peculiarly British tradition of winter musical comedy theater. The tradition takes familiar fairy tales and children’s stories, such as Aladdin, Cinderella, Snow White, and Peter Pan, and injects a bit of vaudeville style, very contemporary references, current music hits, celebrities in the cast, and audience participation to create a raucous, noisy entertainment that’s fun for everyone in the family. The kids are encouraged to “hiss” at the evil characters and call out to the heroes. The “sidekick” character talks to the audience. It is great fun and the comedy is written on levels for BOTH kids and adults. LYTHGOE FAMILY PANTO produces fun, musical theater the whole family can enjoy, and pride themselves on creating a memorable experience a family can share together. Known for their creativity and involvement in the television hits American Idol and So You Think You Can Dance, the Lythgoes are dedicated to bringing affordable theater to families across America. Based on the Grimm fairy tales and others, each story has been modernized with topical scripts for parents and well-known pop songs for kids. We recommend that you arrive early to meet at the theater before the show. They have created a “Christmas Village” theme in front of the theater that the kids LOVE. In past years they have had fake snow falling, games,and fun winter photos the kids can have taken that you can download (for free). Sometimes they have Santa as well. And the kids can all hang out together before going to their seats. Our group will meet in the lobby right after the show, and Wayne Page I will take everyone to the VIP area. If you have questions, please contact Wayne Page, LCHS Spartan Boosters, via email, or at 323-646-5704. Friday night was a spectacular Winter Spectacular! All the students played beautifully and I was so glad to have been a part of a wonderful night of music! As we wrap up this semester, I wish for calm, focus, and success with our students’ finals, and also fun and celebration for the completion of the first half of this school year. I wish for all of our families love and joy and gratitude. May you all be well and may the new year be a blessing to you. Last chance to join! If you’ve only paid the deposit, another payment must be made before December 15th, or you will be dropped from the trip. Please apply/renew your passport. Scan a copy of your passport and send to Mr. Stone for safekeeping and quicker replacement if necessary on the the trip. All Instrumental Music Parents are invited to attend. The MPA holds monthly meetings to discuss and plan events for the Instrumental Music Program. Without this organization, the Instrumental Music Program would not exist. Parent shirts and jackets will be ready for pick-up at the meeting. All payments should be made payable to, “LCHS MPA.” There are a few shirts/jackets still available. After this month’s meeting, we’ll have a Dinner Show planning meeting. We have several volunteer slots to fill as we prepare for the biggest fundraiser of the year. Order forms will be available soon, and donations are already being accepted for silent auction items. Please contact Nadia Ali with any questions. The Orchestra and Wind Friends performed at the three elementary schools in the district on Friday. It was loads of fun and lots of really good music-making! A big thank you goes out to our adult chaperones, Yvonne Lim and Sandy Miller, who made sure everyone made it to the bus! Thank you to Mr. Stone and the winds/percussion who added a special dash of spice to our sound! 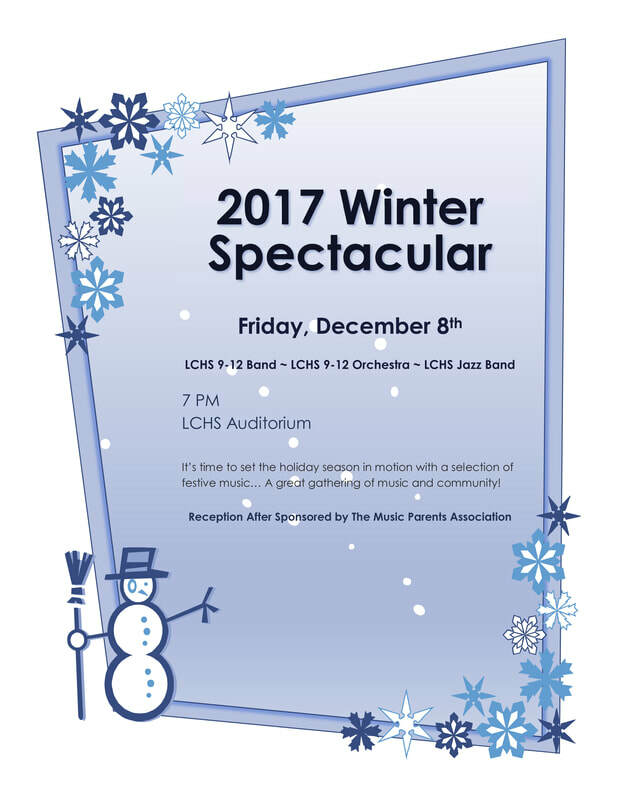 This coming Friday, December 8th, is our annual Winter Spectacular Concert at 7pm in the LCHS auditorium. CALL TIME for Orchestra is at 6:30pm. 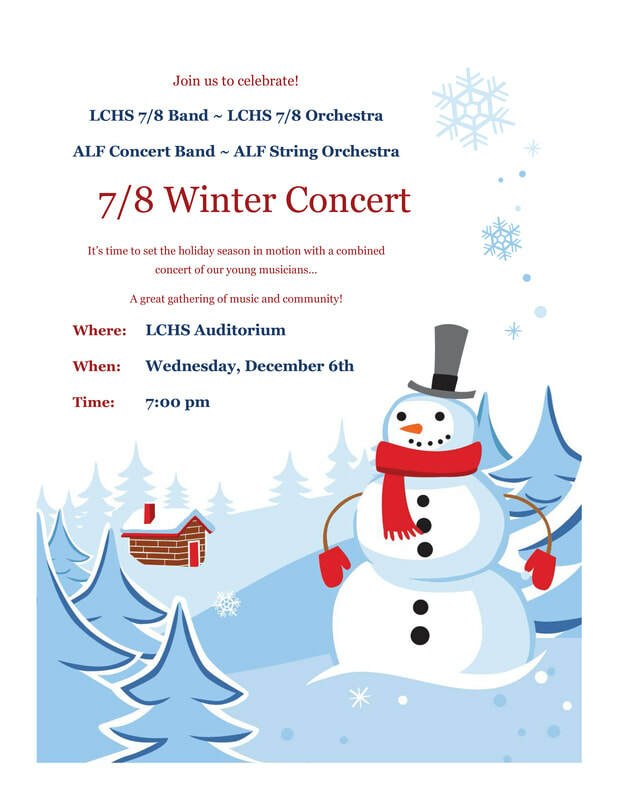 This concert is always a holiday favorite and highlights the 9-12 Orchestra and Winds. There is a reception after the concert, hosted by our Instrumental Music Parents! Please plan to attend and bring friends and family for a great start to the holiday season. Many thanks to Sarah Bartels Nagel, and her team of volunteers, who helped organize the Poinsettia sale! Thursday is pick-up day. Please be sure to pick up your orders between 3pm and 6pm at the Band Room! 3pm to help with moving the pick-up process along smoothly. If you are available and willing, please contact Sarah Bartels Nagel. Thanks in advance for your help! The concert season has arrived for band, while orchestra has already been working hard this past month in preparation for the Winter Spectacular. Come and see these amazing groups, with the added fun of the Jazz Band, as we set the holiday spirit in motion for everyone! It’s a great gathering of music and community. Looking forward to seeing you all there!